When our children’s earliest years consist of high quality care, enriching experiences, and academic preparation, we all benefit. The first eight years of a child’s life are critical because, in this short time span, the building blocks for optimal development are established. Early relationships (both familial and external) lay the groundwork for academic preparation and social/emotional development. Brain and vocabulary development directly influence academic success; social adjustment and self-regulation impact behavior. How we think, learn, communicate, concentrate, problem solve and relate to others when we get to school and later in our lives depends in large part on the experiences we have and the skills we develop during the earliest days, months, and years. Without these vital skills, windows will close and will not reopen again without costly remediation, if ever. 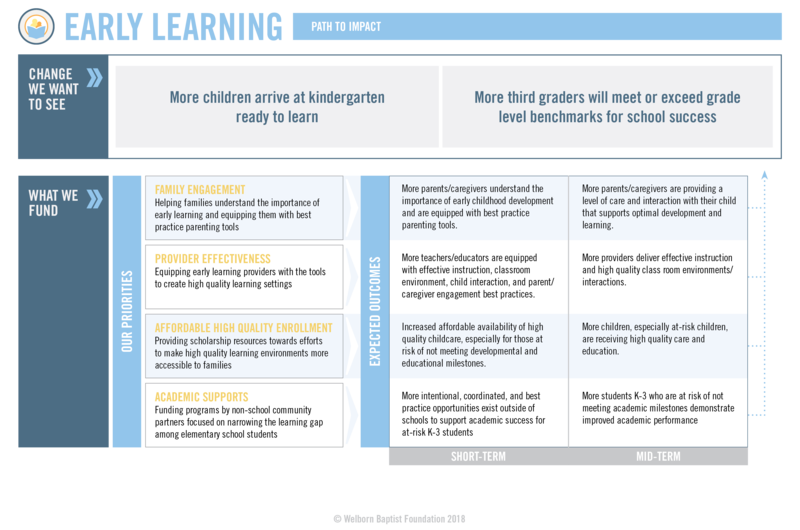 Because of the complex nature of early childhood development, multiple audiences - including parents, caregivers, teachers and communities - must work together to ensure that children enter school ready to learn and that they remain on that path. To learn more about Early Learning Investment Stategies, click here to view our whitepaper.